IONI hardware design ready and sent to production! This week we have reached the point where we could no more improve the hardware design of IONI. We celebrate this today by placing the first release candidate batch (10 pcs) of IONIs in production. Factory quoted lead time is 4 weeks from the order. IONI see-thru image in autumn colors. 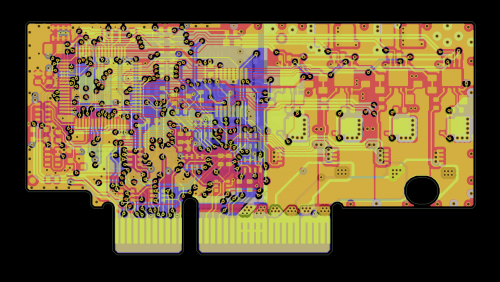 The final board is size is is 69.5 x 36.5 x 6.5 mm. Meanwhile firmware will be finished so volume production should be able to start right away from prototypes are received and tested. Also production of IONOSPHERE will be begun at the same time with drives. We haven’t yet decided whether to rename IONOSPHERE as IONISPHERE. Which one do you like better? Let me know in comments!